Rev. William Robinson Clark, the subject of this memoir, was born in Inverurie on the 26th of March, 1829. He began his education at the Grammar School in Old Aberdeen and from this institution passed to King's College, Aberdeen, from which he graduated M.A., with honours in 1848. Proceeding to Oxford he entered Hertford College and received his B.A. degree in 1863 (I think was 1864 and his M.A. in 1865). After leaving Oxford he held two successful curacies for a short period and his exceptional abilities were recognized by his appointment as Vicar of the parish church of St. Mary Magdalen, Taunton. 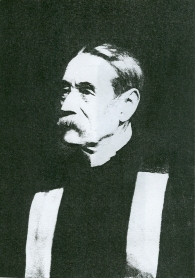 He retained this position for twenty-one years and during a part of the time he was also rural dean of Taunton and Prebendary of Wells Cathedral. He left Taunton in 1880 and spent two years at literary work in England. He came to America and was connected for a short time with Hobart College, Geneva, N.Y. In 1882 he was appointed special preacher in St. George's Church, Toronto, and in the following January professor of Mental and Moral Philosophy in the University of Trinity College (Toronto) with which he maintained an unbroken connection till the time of his death, on 12th of November, 1912. When the chair in English was established in Trinity College he became the first professor, holding this chair together with that of Philosophy for several years, till he resigned the latter pursuant to the changes brought about by the Federation of Trinity College with the University of Toronto. To the onerous duties of these two chairs, he added extra courses of lectures from time to time in history and in several branches of theology, a department of study with which he was thoroughly conversant. In 1908 he retired from active service, with the title of Professor Emeritus, retaining his seat on the Corporation of Trinity College and continuing to attend its meetings regularly as long as his physical strength permitted. Among honours and distinctions which were lavishly and fittingly bestowed upon Dr. Clark by institutions of learning, are the degrees of Doctor of Civil Law, conferred by Trinity College, Toronto: Doctor of Divinity, conferred by Queen's University, Kingston (Ontario): and Doctor of Laws conferred by Hobart College, Geneva (now HWS University, USA); his appointment by the University of Michigan to be Baldwin lecturer in 1887, and Slocum lecturer in 1889; his appointment as Honorary Professor of Hobart College, Geneva, in 1888; his election in 1891 as Fellow of The Royal Society of Canada and in 1900 as President of the Society. The Empire Club of Toronto owed much to his strong support, and elected him President of the Club in 1905. He took a prominent part in the Synods of the Church and in other representative gatherings of Churchmen and of Litterateurs, where his scholarly treatment of every subject he touched commanded the attention and respect of all. In 1907 he was appointed Honorary Canon of St. Albans Cathedral, Toronto. As a preacher and a public lecturer Professor Clark was very highly esteemed, and his many engagements in these capacities served to make Trinity College favourably known far and near. His sermons were models of forceful argument, logical presentation, and perfect diction, as well as being full of spiritual power. In his class room work and on the public platform he showed not only brilliancy but remarkable versatility, as he did also in his literary productions, which embrace Theology, History and Literature. Of his published works, the best known are "Savonarola," "Pascal," "The Paraclete," "Witnesses of Christ," and "The Anglican Reformation." Important also are his translations of Hagenbach's History of Christian Doctrine, and Heffele's History of the Councils. His last work was an interpretation of Kingsley's Water Babies, an annotated edition of which he published hardly more than a year before his death, embodying in it the substance of a lecture delivered in public by special request more than one hundred times. The Royal Society obtained the support of a skilled lecturer and one whose interests were ever in the highest planes of literature and life. When he filled the President's office his personality did much to make the year specially successful, and the meetings of Section II, when he was present, were always interesting, and his contributions to the discussions were most valuable. I am indebted to Jeanne Salo, Royal Society of Canada, for the photograph and information. Note. The parentheses are mine by way of global-understanding, modern connection, and possible correction.